Justice Christine S. Vertefeuille is a Connecticut native, born in New Britain on December 10, 1950. She graduated from Trinity College with a Bachelor of Arts in Political Science in 1972 and the University of Connecticut School of Law with a Juris Doctor in 1975. Justice Vertefeuille was in private practice from 1975-1989 During that time, she was a member of the Executive Committee of the Real Property Section of the Connecticut Bar Association (1988-89), the Cheshire Commission on Handicapped and Disabled (1988-89), and an alternate member of the Waterbury and New Haven Grievance Panels (1985-89). Justice Vertefeuille began her career as a judge with her 1989 appointment to the Superior Court. During her tenure as a Superior Court Judge, she presided over the Connecticut silicone gel breast implant cases (1993-99). In addition, Justice Vertefeuille served as the Administrative Judge in the Waterbury Judicial District (1994-99) and as a Complex Litigation Judge (1999). She was the recipient of the 1995 Judicial Award from the Connecticut Trial Lawyers Association. While serving as a Superior Court Judge, Justice Vertefeuille was on the faculty of the Connecticut Judges' Institute. Justice Vertefeuille was appointed Judge of the Appellate Court on September 13, 1999, and Justice of the Supreme Court on January 3, 2000. 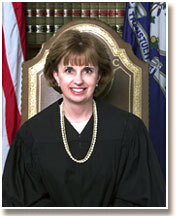 She served as the Administrative Judge of the Appellate System from June 1, 2000 to July 31, 2006. Justice Vertefeuille became a Senior Justice of the Supreme Court on June 1, 2010. She served as Co-Chair of the Advisory Committee on Appellate Rules from 2009 to 2013. Justice Vertefeuille served as a member of the Fellows Education and Program Committee of the Connecticut Bar Foundation. In October of 2006, she was awarded the Tenth Anniversary Award from the Polish American Foundation of Connecticut and in May of 2006, she received an honorary doctor of laws degree from the Quinnipiac University School of Law. In December of 2004, Justice Vertefeuille received the Gatekeeper Award from "Common Good," a national organization devoted to restoring public confidence in the law.